I was biking around L.A. today (it's National Bike Week) and I was observing all the traffic along La Brea Avenue while I was eating lunch at a cafe. 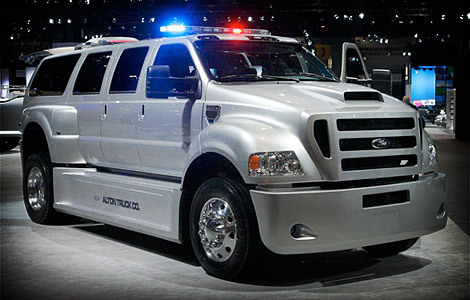 What struck me was how many over-sized vehicles drove by with only one occupant -- the driver. While the occasional Toyota Prius was seen, the majority of vehicles were big old gas-guzzling SUVs like the Hummer, Land Rover, Ford Escape, Dodge Ram and other pre-historic fossil fuel eating monsters. I often wonder if the owners of these vehicles realize the immense harm their lifestyles are doing to the environment, not to mention our national security and their own bank accounts. Maybe some of them bought these heaping hunks of carbon-spewing metal back in the '90s and just can't find a way to get rid of them. But didn't they hear about the Cash for Clunkers program? Maybe their environmental impact doesn't even cross their shallow minds. Maybe it is a security or status or ego issue -- people feel more powerful in a bigger vehicle. A few weeks ago I had a conversation with a couple of tourists from Copenhagen, Denmark. They were amazed by the number of big cars on the roads. In Europe it is normal to drive smaller vehicles. America's love affair with everything big must end for the sake of the planet. Thankfully two clean electric cars will be on the market at the end of this year -- the Chevrolet Volt and Nissan Leaf. It is the start of a new smart car era when we can start to get these big dumb cars off the roads. While I was biking today I decided to take the sidewalk because this is L.A. and the sidewalks are usually empty. The problem with biking on the sidewalks is that they are actually bumpier than the pothole-ridden roads. I used to think the reason the sidewalks are hillier than the Hollywood Hills was because of the frequent earthquakes in the Southland. But that's not the case. It is actually human error that causes the concrete to resemble something out of a Salvador Dali painting. L.A. has been very successful at planting trees all over the city as part of the Million Trees LA program. The program has been a great success by greening and beautifying the city as well as making the air cleaner. The problem is that the wrong types of trees have been planted on city sidewalks. The trees that line L.A.'s boulevards are huge and the roots grow outward more than downward. So these big roots end up tearing up the sidewalks. Brilliant. 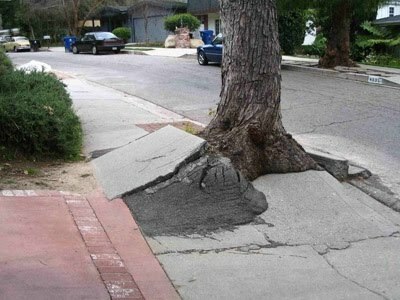 If they planted the correct kind of trees that have roots that go straight down, then the sidewalks would be immaculate. It is perhaps one of the dumbest urban planning ideas in the history of cities. And they are still planting these trees with the big roots that protrude outward. So expect more bumpy sidewalks ahead. Better have good shocks on the bikes! And on top of that, the City Council is considering repealing a 1974 ordinance that made the city responsible for footing bills for sidewalk and driveway repairs. Unreal. The city created this problem by planting the wrong trees and now won't pay to fix the sidewalks! According to the L.A. Times story, the city spends $3 million to $5 million a year to defend or settle suits arising from sidewalk "trip and fall" injuries. "Of the city's 10,750 miles of sidewalks, roughly 4,600 miles are in need of repairs, at a projected price of $1.2 billion, said Ron Olive, assistant director of the city's Bureau of Street Services. Since 2000, the city has spent about $95 million to replace 550 miles of sidewalks."